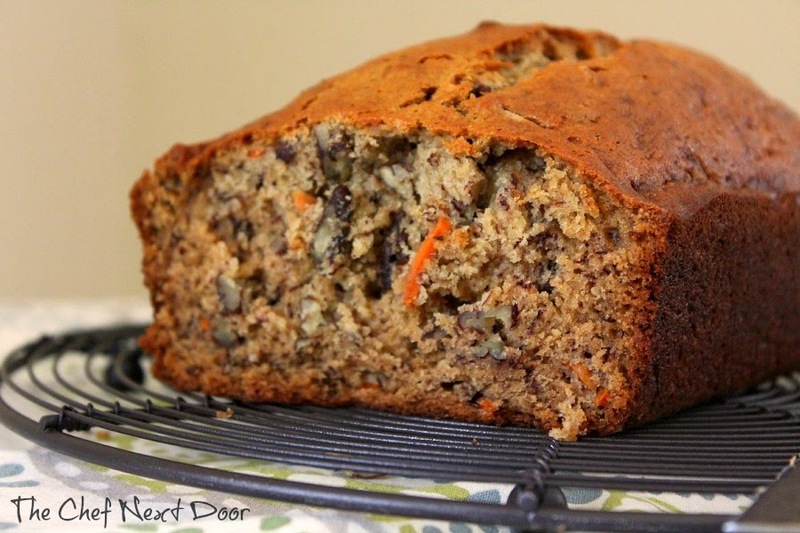 A moist and tender banana bread filled with little carrot and pecan jewels! I love banana bread. 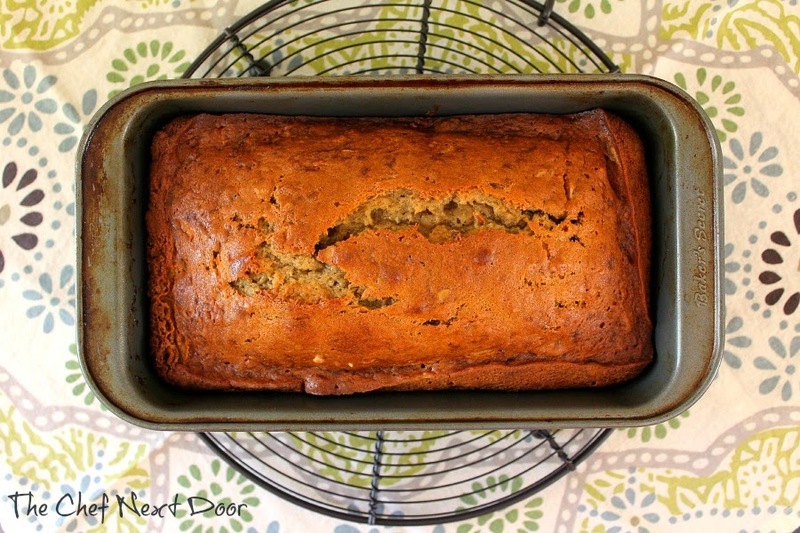 Seriously, I'm a self-professed banana bread junkie. During the fall and winter I definitely make a loaf every couple of weeks. I mean, what's not to love about it? First off, the scent of fresh baked bread in the kitchen is incredible. Breads with spices like cinnamon and nutmeg especially. It literally perfumes the entire house. 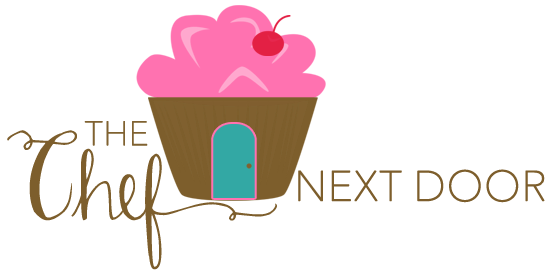 A perfect time to bake is when you have company coming over. No candles needed, just the delicious aromas of banana bread wafting through the air. 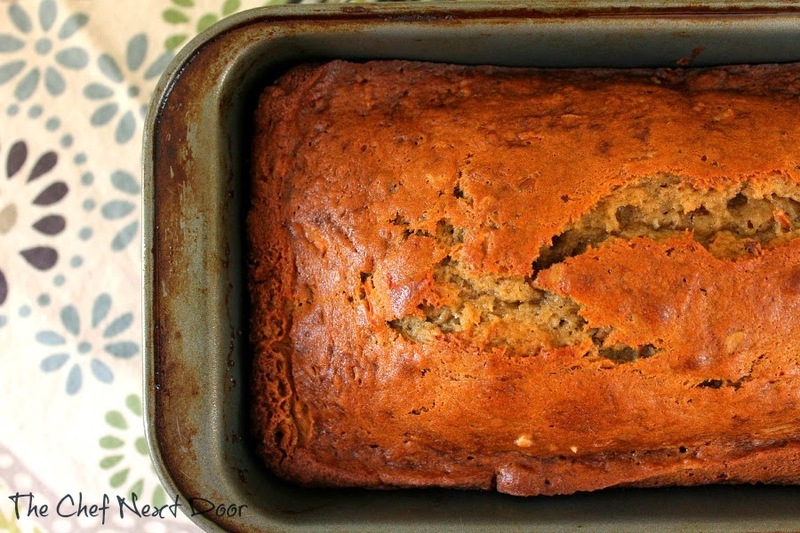 The second thing to love about banana bread is the taste. Just plain and simple, it tastes delicious. To me it's pure comfort food, and reminds me of my childhood. This version of banana bread is a bit different. I tucked in a couple of fun ingredients, one of which most people wouldn't guess. You wanna know what my secret ingredient is? Carrots. Yes sir I said it, carrots. This is like a toss between banana bread and a carrot cake. It's fun. It's tasty. And you can sneak in some veggies without your kids even knowing. Did I mention it's really, really good? Preheat the oven to 350 degrees. Spray a 9x5 loaf pan with baking spray and set aside. In a large bowl whisk together the flour, baking soda, salt, cinnamon and nutmeg. In the bowl of a stand mixer, beat the eggs and sugars until completely combined. Add in the bananas and coconut oil. Next, slowly add the dry ingredients to the wet ingredients until incorporated. Fold in the carrots and pecans with a rubber spatula. Pour the batter into the prepared pan. Bake for 55-60 minutes, or until a cake tester inserted near the center of the loaf comes out clean. Cool the bread in the pan on a cooling rack for 15 minutes. Remove the bread from the pan to finish cooling completely on the rack. Slice and serve.